The Last Roman offers the setting of 533 in western Europe, at three turns per season, set in the former grandeur of the Western Roman empire, and tells the story of Theodahad the Ostrogothic son of Theoderic the Great, who had overthown the half Hunnic king Odovacar at a banquet and ruled over a prosperous Italy, Gelimer and Hilderic the Vandal Kings in north Africa, the invading Flavius Belisarius and Justinian, Justinian's high and mighty wife Theodora, and Belisarius' adulterous wife Antonina. Also featured is Amalasuntha, the pro-Roman queen of the Goths who is imprisoned during the campaign, your mission to rescue her as the Romans, the four Frankish sons of Clovis, led by Theuderic, and Theudis, representing the Visigoths, the former swordbearer of Theoderic the Great. The subject matter is rich with intrigue and the play Titus Andronicus by William Shakespeare comes to mind regarding the byzantine personalities. Depending on your faction, you will start the campaign with a spy, champion, or priest, and like the original, these pools will grow alongside your imperium. Their models progress over time and their skill trees sometimes compliment their faction traits, as with the Vandals. The major dilemna the player is proposed with is to secede from the Empire and create the Kingdom of Rome, or loyally serve Justinian, who continues to reward loyalty over the game's length until the time comes that 40 regions have been acquired and the empire will become one entity. The barbarian kingdoms, really any of the playable factions also have the option to join the empire by making an offer with another faction to join the Western Roman Empire after they control 40 regions. During the course of the campaign, the Moors will invade Africa, and the Lombards will arrive on the scene in northern Italy in scripted invasions, though nowhere near on the scale of the titular Attila in the original game. It's worth noting that although the Bretons and Basques are also featured in the game, they have Germanic rosters rather than Celtic ones, although they have Celtic naming conventions. The Suebi and Burgundians are the other factions on the map, along with the rebel Sardinians led by the Vandal usurper Godas. The Vandals are challenged with repelling the Roman reconquista led by Belisarius, ending the civil war in Sardinia, fending off the Moors, and maintaining relations with their Berber and Goth neighbors. They specialize in raiding. The Franks control a large empire in Gaul, and their first obstacle is removing the Burgundians so they continue their war with the hated Visigoths. Like the Vandals, who are ruled by three brothers, the grandchildren of Gaiseric, Clovis' had four sons, and they are intended to be rebellious amongst each other. They specialize in integrity over battle losses. The Visigoths have the easiest start position on the map in Hispania, and their first concern will be removing the Suebi from Gallaecia. They have a very large amount of territory to begin with, rivaled only by the Ostrogoths. Whereas the Ostrogoths control a united Italy and Sicily, and parts of Dalmatia. They are the main objective of the other factions, with all of them desiring to rule from Rome, or reclaim it, as is the case with Justinian. They specialize in tolerant society. Belisarius, the Roman expedition, starts in souther Byzacena in Africa, on the doorstep of the Vandals. I won't say to much, but the Vandals are preoccupied with the Sardinian rebels at the start of the DLC campaign. This is probably the most detailed map that has ever been put into a campaign for Total War. From Epirus to Lusitania and to the north of France, the map makes good use of rivers and roads, and other terrain. Unlike other campaigns, you are given the ability to upgrade your roads capabilities through Winemakers and other trade related buildings. As has been mentioned in other people's impressions, battles for entire regions are often decided by a single large battle of multiple army stacks. Each faction has a distinct climate and terrain that governs the majority of their territory, and one would think adaptation would be a key, but once you leave your topographic and climate region the inclination is to steamroll the map, which isn't very difficult as the Vandals and Romans. Your generals start the game mounted on horseback, which is a welcome change from the original title, and the battled really feel epic and decisive for the future of the campaign. This is one of the few TW games I'd recommend playing on Legendary. I've yet to resave to and earlier date, and I don't think I've felt as much conviction for each victory and defeat since Shogun II. 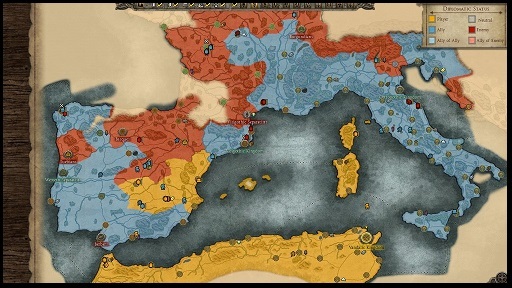 Despite being the norm for total war games, a train of stacks coloring the map is compounded in the Last Roman, by the fact that the AI really feels the weight and distance of the map, often unable to support more than three stacks. Smaller factions can only afford one or two, which is a huge departure from the very powerful factions of Attila that could field many armies from a couple of regions. I'd say CA over-learned their lesson from feedback in this case, because on Hard, it's far too typical for the AI to take run of the map in single general armies that besiege, and move from raid or sack to another settlement. The AI is a vast improvement from the razing habits of Attila, but doesn't seem overly eager to take new territory: this impression is hammered home by the time per year, so that it's a realistic progression, however the player has no such restriction, and it's only missions or scripted events that force the player to consolidate their own land, well into what is considered late game and chapter four. This said, the elements don't hurt your troops in a drastic way, and most of the attrition you'll face is from famine, in the long months. The seasonal gameplay that was established in Caesar in Gaul really comes in handy here, at the very least giving the player an incentive to keep playing for more turns in a session, and I feel I've learned a thing or two about the fall harvest and the rhythm of the seasons etc. from the game. With 12 TPY, the family tree makes a return, but administration feels slower. Only three generations occur from the onset of the game to the 'end' so you won't have a vast dynasty by the time you reach your victory. Adoptions and intermarriage between factions feels that much more important as a result. It would be silly to include infant mortality in a game like the Last Roman. Neglected aspects such as military positions can be focused on with greater attention, and if you miss a turn, you won't feel the consequence of it. What you will feel consequences for is a woman scorned, and both leading ladies will financially and materially sabotage your efforts in the old empire. In addition, the Roman family tree is full of titles and surnames that tell where the character is from, often with Christian names, signaling an entrance into the dark ages. The Vandals, Franks, and Goths, all have new contemporary names added to their rosters as well, and all of the factions have one or two starting character's with unique portraits or armor, and the armor is inherited by their successor, which gives the game a feeling similar to Shogun II. Historically, Belisarius was able to force Gelimer to abdicate, and was offered the position of Emperor by Totila upon taking Rome from the Goths, which he agreed to, only to hand the city over to Justinian once he was within it's walls. Justinian ordered him home for a time after this, seeing what could conceivably happen if his favorite general was allowed to become to powerful and popular. The Last Roman allows the player to explore that opportunity, and declare oneself the emperor of the West as Totila suggested. For the Expedition, this is not an easy prospect, especially early on, as Justinian inspects his new territories, and garrisons them with Roman forces that vastly outnumber the expedition, which acts as a horde, encamping to recruit or save upkeep, and become a more advanced camp, with a new building and technology tree. For the Romans the civic tree seems heavily focused on encampments, while for the barbarians it's almost stripped bare to the ability to build structures, most of which were present in the original game, but some which are not. There are only three cultures with building chains in The Last Roman, with the Berber structures needing to be converted to alternatively Germanic or Roman ones. The Expedition doesn't have to worry about this, as the majority of the time will be spent liberating territory, through the 'reclaim.' button. Once a new settlement is conquered, this settlement will become part of the Roman Empire, and it will be patrolled by Roman troops. One interesting feature is the war target coordination for the Romans, which allows you to interface with your home countries military. Fleets leave routinely from Dalmatia and Epirus Nova, and don't be surprised if you see the Emperor with his crown on the map. A tempting target for usurpation, but we're more loyal than that, aren't we? It's only after you've been gifted with supporting armies and feel insulated from your enemies, and friends you may have made, that you'll feel comfortable for independence. I hear the financial penalty for starting an empire of your own prematurely is also quite severe, with -3000 income being the first of your worries, with a larger deficit for larger armies. Periodically, Theodora and Antonina, your wife, who historically was suspected of sleeping with your adopted son, who incidentally sires loads of illegitimate children, will offer you missions, and these missions will in turn affect the way the Emperor views you and orders his own missions. Like a role-playing game, there's plenty of room for replay with the Roman expedition. The Germanic kingdoms receive historical objectives, and event messages, but this part of interactive decision making is sorely lacking from them, and the game felt a bit empty between major events as the Vandals. With modding, the game has immense potential for replay as traits are acquired slower and less frequently. I did feel the pacing for the new skill trees for generals advanced at a very good pace. New skills include charge bonuses, attrition bonuses, and integrity bonuses. Integrity is vital, very early in the game, and decimation is often the only way to keep your few armies from starting a civil war with some factions, which will occur over the campaign and help spice up the diversity of factions over the vast map, as well as give you inlets into your allies territory in the midst of their civil wars. Encamping as the Romans is one way to preserve integrity, as well as save costs on upkeep when armies are resting or stationary. At a certain date, the skies will turn dark and it will begin raining ash that is visible on the campaign and battle map. This was a phenomenon associated with a super-volcano in Indonesia that baffled the Romans and Germanic cultures at the time. If you would like to know how long the event lasts, I'd recommend you research this event. This climate effect turns the map into a similar effect as a solar eclipse, and the player is left in the dark about how long the sky as dark as black satin will last. The depressing atmosphere really gives the player an incentive to see the light at the end of the tunnel, and the campaign map looks glorious in color once daylight returns. The feeling of running a rescue mission near Rome, personally by Belisarius, under the cover of night, for a raid, is an exciting feeling, and for these reasons I really have to recommend the Roman expedition as the player's first campaign in The Last Roman. It also gives the player a chance to start from the ground up as a Roman horde, which was missing from both Roman factions in the original game, with a diverse and advanced Roman roster that reflecting new technological innovations. This game really signifies the end of the Roman era and the entrance into the early medieval dark ages, as per it's billing. Out of the new units, most of them are late tier, and if you haven't played all of the great migrators before, the factions will feel very fresh and polished. It's effective at portraying the geo-political climate at the time, and provides more intrigue for the Roman expedition than any previous TW title has offered. MAP- 7/10 This map is a real gem, with modding potential for both a Punic wars and Epirot Wars mod campaign, and early on will feel very vast, even for a large burgeoning kingdom- I would have preferred a grand campaign like many on the TWC, but the map is effective at telling the story of Justinian and Belisarius, and the court of Constantinople. It only loses points for the AI's in-effectiveness of lording over and conquering it's dotted settlements. CAMPAIGN AI 5.5/10 The game has no problem handling the vast distance of the Mediterranean, and there are no naval navigation problems that plagued HatG, but it falls short in other facets that will likely be tweaked in a further patches. The AI isn't stupid by any means, and you'll be pleasantly surprised by how competent it is at times, but there seems to be a curve between what it can do and what it should do. 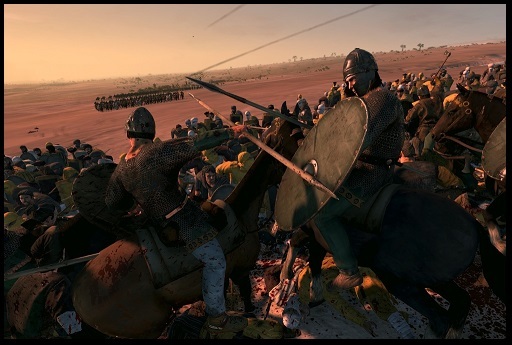 An improvement over Attila, but better left for the Grand campaign, where minor gains would look impressive. I saw too many one general armies besieging settlements they have no hope of taking. Also it is slow at taking territory, or tipping the balance one way or another between the massive power blocs that emerge after alliances. The game relies on the player to 'save.' a faction, or tip the momentum the other way, by wiping out the weakened enemy. It takes the player matter of turns to recover from years of war, but the AI never really does return to it's maximum army capacity at the start of the game. This was especially true with the Visigoths who were nearly wiped out, but even the Franks don't have more than half stacks cruising through allied territory. The end-game, unfortunately, is a cake walk, with your allies in place, although I could see how without proper diplomacy you could be on the receiving end of a disaster. GRAPHICS 10/10 With new armor sets and new units, new helmets, and new character models they game is as beautiful as the original campaign, and weather effects look great and effect the outcome of battles. Gelimer, the Vandal king, starts on a throne in the faction selection screen, and true enough, is king of both Vandals and Alans. The characters, due in part to being on horseback, feel like they've progressed the hundred some odd years since the original from their gilding to the variety, and the generals look distinguishable from one another. The original only provided distinction on three levels, up to High Kingship, whereas The Last Roman makes the character's adornment specific to the character. The game emphasizes that not every disaster is beautiful. The game is ugly at times and knows it. The pumous rain looks as daunting as it sounds. You can visibly make out which cities are being ravaged by bubonic plague, typhoid, measles, or smallpox from a zoomed out distance, and avoid them accordingly. The Last Roman is about events. The amount of attention that went into the art for events has also gone into the art for a new building system, that is more feudally oriented. The new buildings also focus on the units themselves and their quality, another reminder of Shogun II. There's a new skill tree for the armies themselves and it helps give the feel of an advancing hardening army, that only grows in ability, and your reliance on those original armies and their integrity. It's about a historical narrative that can be bent but not broken, until the moment of insurrection, specifically meant to be enjoyed as the campaign of the general Belisarius. The game has both Separatist and Loyalist campaign objectives and historical rewards for the Romans. The characters and the missions they provide have personality, and you feel a sense of national pride as any of the playable factions. They remain unique, though you can't help but feel the absence of Roman emergents on the map, and question why someone would opt for the Visigoth roster over the Ostrogoth one, other than their map location, and their status as the sole surviving party other than the Eastern Romans that gave rise to Castille and Leon. Battles feel decisive and are well balanced. The Moors and Berbers don't feel overly strong, and the Romans have just the edge in technology you would expect, with a great roster. The campaign objectives are reasonable, especially with minor penalties for great power, which makes victory by way of military alliance possible. The game was a victim of it's own success, that leaves wanting out of the playable options of Barbarian kingdoms, but still provides complete and unique rosters and epic battles on great maps of 6+ stacks of armies, from a very detailed and beautiful, geographic map. The Romans have many options for an exciting and new Total War campaign, while the barbarians are left to make their own fun, more in the vein of Napoleon, with much less armies. The roads are readily visible, and the game feels more polished and civilized, as the new building trees emphasize than previous Rome and Attila campaigns. In all, the campaign is well worth it's price, for the Roman expedition and the new map alone, but feels a bit bland for the Germanic Kingdoms due to a reoccurring issue with armies not recruiting full or half stacks, but instead rushing to sack settlements with generals. I'm greatly looking forward to playing some of the other factions for over twenty turns, and especially completing the campaign as the Roman expedition. I also can't wait until someone makes a Justinian era grand campaign mod or map with this campaign's AI, because I think that would be a superb experience. All's said, you will not be disappointed with the quality of this campaign pack.